HOW TO GET CLEAR SKIN || MY SKINCARE ROUTINE | RAWR BOWS. I’ve never been one to break out really badly or to have terrible acne. However, Santa Claus came loaded with chocolate, greasy food and lots and lots of all sorts of cakes and pastries. And, by Santa Claus, I mean my mom. I went home for Christmas and I ate, in a span of 3 weeks, all the fat and sugar my body needs this year. This, of course, caused my skin to look far from clear. After getting back to London it was about time to step up my game and try to make my face look somewhat decent again. So, here’s what I do on a daily basis. The first thing I do when I wake up is wash my face with some water and, unless I’m feeling terribly lazy, I’ll use Neutrogena's Spot Stress Control Daily Scrub to get rid of any possible dirt that can be sitting on my skin. Then, I’ll use Clean&Clear's Dual Action Moisturiser to hydrate my skin before applying my foundation. I love this, it's so thick and hydrating but doesn't feel my skin feeling oily at all, it also feels quite refreshing, unlike most moisturisers which feel sticky and a bit gross. 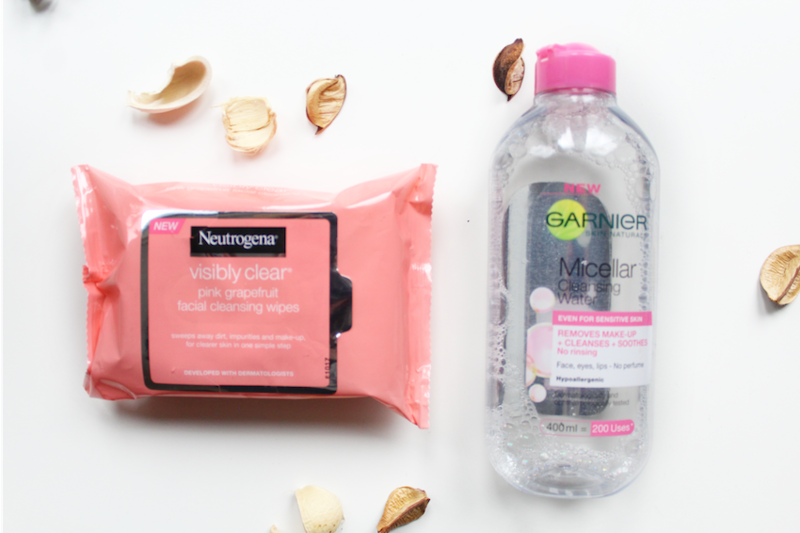 When I get home after school I’ll sometimes use the Neutrogena's Visibly Clear Pink Grapefruit Facial Cleansing Wipes to take off my foundation if my skin is feeling a bit oily that day or if I just want to let it breath. I don't really love this wipes as I fine the smell is a bit unpleasant, even though their pink grapefruit scrub does smell really nice, and they feel a bit dry. Not to mention they were £4, definitely not worth them money. I personally prefer Clean&Clear's wipes or Garnier's. 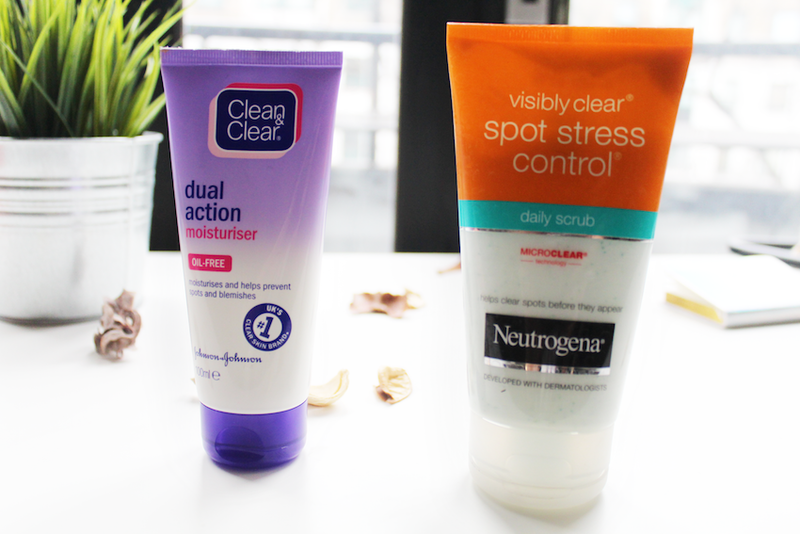 I’ll use Neutrogena's Spot Stress Control Daily Scrub to take off most of my make-up whilst I shower. I use Benefit’s They’Re Real Mascara, which is quite hard to remove so no scrub or water does the job. After showering, I remove the remaining mascara and any possible traces of foundation left on my skin with a cotton pad and some Garnier Miscellar Water. Right before heading to bed I’ll moisturise my face using Clean&Clear's Dual Action Moisturiser. 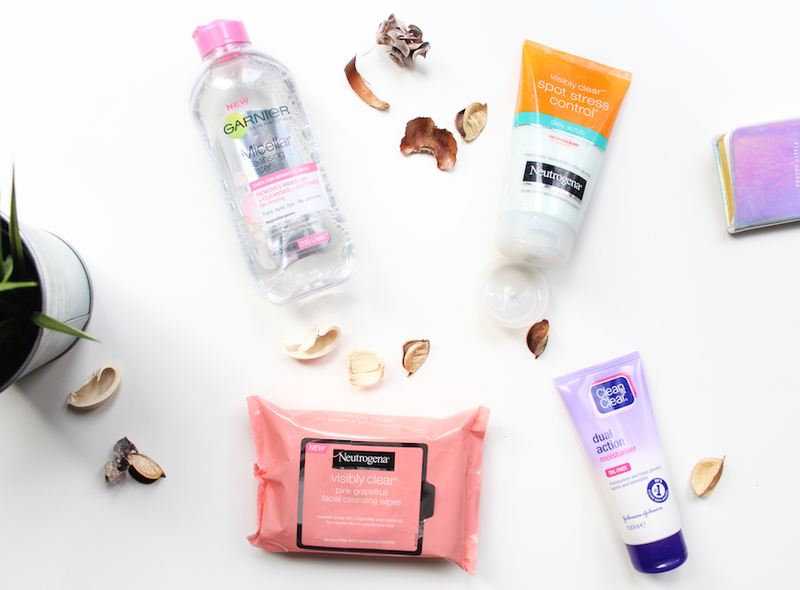 As you can see I keep my routine fairly simple and try not to use many products. This is not only significantly cheaper and less time consuming, but I also don’t like to put a lot of different things on my face as I feel that can sometimes make me break out even more.